Brad didn't see his weight as a problem until his father died of complications from obesity. When reality hit, the teen had a choice to potentially suffer the same fate or lose the weight. I was never happy being overweight. Getting teased at school, and feeling uncomfortable and constantly tired wore me out. I almost learned to accept it and didn't think there was a problem with it or that I needed to change. My father, who weighed 340 pounds at 5-foot-8, suffered a massive brain stem stroke at the age of 48 that paralyzed his right side. He was barely able speak and was fully reliant on others. It ultimately led to his death two years later because he was unable to communicate that he had chest pain that turned out to be lung cancer. By the time we caught it, it was too late for him. It took two years of grieving and more weight gain for me to realize I was headed down the same path. So I picked myself up and decided I wouldn't allow myself to be unhappy anymore. I deserved a better life. Accomplishing my goals wasn't easy. At age 16, it's hard to educate yourself on proper nutrition and exercise. At my weight, I was successful at the start. I cut out soda, fast food, chips, and snacks, and started running. 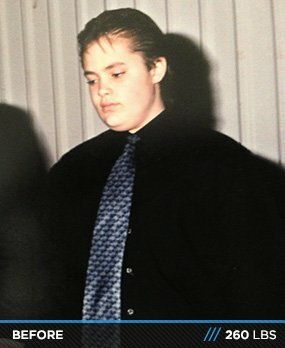 It was all I could do by myself, but I lost 80 pounds that way. Removing bad food and adding cardio got me far, but eventually I stalled at 180 pounds. I got a gym membership two years after starting my weight loss goal and signed up with a personal trainer to learn more about lifting. Shortly after, I decided to run the Chicago Half Marathon in September 2009. I had a personal trainer for a year and it was the best decision I made because it gave me a foundation for today. Nine months into my personal training sessions, I had an accident that fractured three vertebrae and left me with three bulging disks in my lumbar. I was unable to do any form of exercise for 3-4 months. I was told by many doctors that I wouldn't be able to lift again. Three months later, in December 2010, I was given full clearance to exercise again and drove directly from the doctor's to the gym. 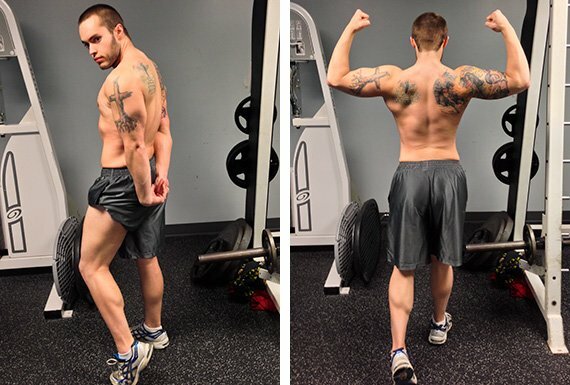 I didn't want to be a skinny marathon runner who lifted three days per week anymore, so I started a three days on, one day off lifting schedule at 160 pounds. I lost serious muscle mass during the three months I was out, which was extremely depressing, but I remembered why I was there and how far I came. I started speaking with the local bodybuilders in my gym and realized it was my passion. To date, I bulked up to 185 pounds and 13 percent body fat. One of the most challenging aspects is starting. In the beginning you feel weak and out of shape. It's really un-motivating. However, once you push past this aspect I feel that it starts to get fun. You make huge gains and accomplish serious goals. Training and nutrition is something I've come to live by and enjoy. It's the highlight of my day now. My future plans are to finish my personal training certification within the next few months and focus on improvement so I can compete in my first amateur show in two years. Take it slow, don't rush weight loss, and don't just do cardio. It may take a bit longer, but in reality it will save you time and setbacks. Try not to look at the big picture. Set small goals and take progress pictures. When you feel down about where you want to be and how far away you are, look back at where you started from. 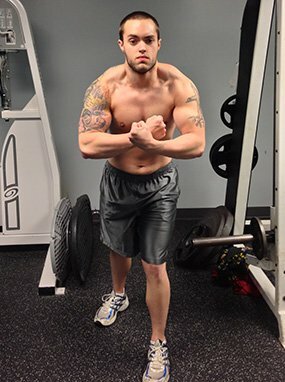 Bodybuilding.com helped tremendously with my overall progress. The affordable quality supplements and the 12-week training programs are life savers. 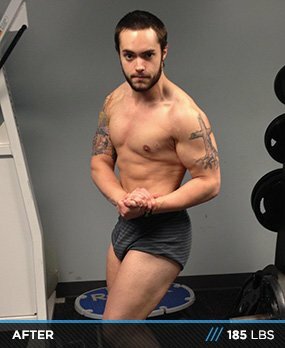 Bodybuilding.com is an amazing tool to educate you about the fitness world.